"People are strange creatures - you can't always convince them safety is in their best interests". It's this line from John Goodman's character that really sets the tone for the mystery that is 10 Cloverfield Lane, a film described as a blood relative to 2008's Cloverfield by JJ Abrams, rather than a direct sequel to the handy shaky-cam, found footage monster flick. If anything this subterranean set film is best described as a taut chamber piece that you're better off knowing little about before viewing. 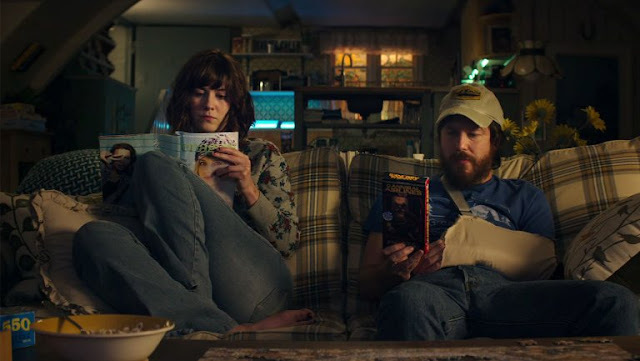 Loosely, Winstead is Michelle, who at the start of the film, is desperately scrabbling around, packing a bag and leaving her other half, for reasons unknown. Fleeing in her car, Michelle's involved in a car accident and wakes to find herself in a dingy room, her leg shackled to the wall, and with no idea where she is or how she got there. So far, so Saw (or so Room). 10 Cloverfield Lane is a masterful execution in suspense and a masterclass of Hitchcockian nail-biting drama in a three-hander setting. Taut and lean, its strengths really are in the way it plays out, as well as the performances of both Goodman and Winstead. As Michelle does, the audience is drip fed potential reasons for her predicament and as a result, the ensuing paranoia is built as we gain empathy for her plight and her mistrust. There's a duality of trust at play here and no one knows who is telling the truth, even though at various stages, we swing the pendulum of doubt either way. But smartly, Goodman's Hector is not just a one dimensional nutbar whose underground plans and murky reasonings make a kind of unnerving sense to the audience. The way the needle keeps flipping back and forth between believing him and distrusting him is sparingly but effectively used and is redolent of the lean story-telling on hand. Thanks to Goodman's relative underplaying of the role (essentially a psychological bully who may or may not be blessed with a dose of veracity) coupled with his implied menace and Winstead's rounded pluck as she goes through her arc of vulnerability to strength, 10 Cloverfield Laneemerges as a thriller filled with dread that rewards as the onion peels back its layers. Hell is very much other people as they say, and in this Fallout Shelter-esque claustrophobic flick, that's evident from the nail-biting beginning. It helps that the Twilight Zone-esque post Cold War vibe is severely amped up by a mood-ratcheting score from The Walking Dead's Bear McCreary, leading to an atmosphere of unease, mistrust and even in its most domestic scenes, distinctly unsettling overtones. If the final act hints at more and sees the expected route taken for a Cloverfield film, then the tense and nervy journey there is nothing short of compelling as the mystery box is opened wide. Unsettling, unease and uncertainty are redolent throughout and Trachtenberg manipulates these well throughout the lean run time (even if there are some mysteries which are never fully resolved). It's dramatic and rare to see a film these days surprise, but thanks to grounding 10 Cloverfield Lane in a relatable humanity and spinning the dial of doubt while simultaneously dredging every last drop of tension, it's one of the best genre films of the year.